Sixteen female Flyweight’s entered the Ultimate Fighter house two month’s ago, vying for a chance to fight at the Ultimate Fighter Finale. This however wouldn’t be just any Ultimate Fighter finale, as two women who remained, would fight each for the inaugural 125 lbs. Championship. It’s an exciting proposition tied into the Ultimate Fighter show, one in which I believe really motivates the fighters even more so than the opportunity to just be under the UFC banner. We all know, generally the fighters who make the most money are the Champions. So for one of these women, there lives will drastically be changed for the better. As for the finalist in the headliner, originally it was supposed to be Sijara Eubanks against Nicco Montano. Unfortunately for Eubanks, a bad weight cut forced her out of the fight and in stepped Roxanne Modafferi. This is the ultimate redemption for Modafferi, as she was eliminated in the Semi-Finals by Eubanks and now has an opportunity to be a UFC world champion. Anyways, I’m going be honest. I barely watched this season and probably the previous three as well. So bear with my lack of knowledge on these predictions! 125 lbs. 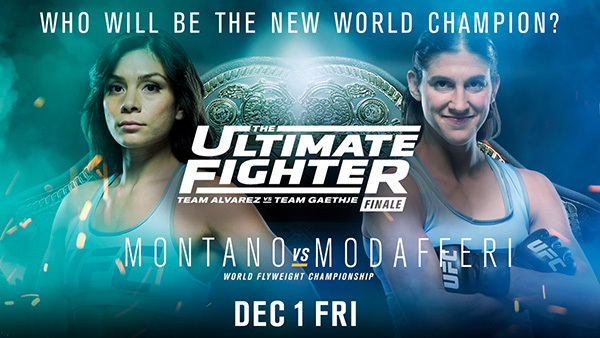 : Roxanne Modafferi vs. Nicco Montano for inaugural women’s flyweight title – I’m going to be honest, I lack knowledge of Montano’s abilities. I know she defeated Honchak in the Semi-Finals, which is impressive. However, Modafferi is a very experienced fighter and has really turned her career around. At rock bottom, she had lost six fights in a row and was cut by the UFC. It appeared like retirement was near, as her skill set was diminished. Then, she left Japan and went to train in the states, finding coach John Wood at Syndicate MMA. It’s couldn’t of been a better fit, as Modafferi has won the last six out of eight fights. Anyways, Modafferi has vastly improved herself as a striker. So much to the point where she could win a fight standing up, which wasn’t the case before. Her grappling abilities are still superior and I think that’s what will ultimately get her the nod in this fight. I see a heavy dose of grappling and top control, ultimately opening up a submission victory, capping off Modafferi’s Cinderella story as the Inaugural UFC Women’s Flyweight Champion. 135 lbs. : Sean O’Malley vs. Terrion Ware – O’Malley is a fun fighter and I’m curious to watch his growth inside the octagon. However, all that flashiness doesn’t work against someone who is well rounded like Ware. He’s show excellent kickboxing abilities and I believe that he can avoid that one-shot knockout blow O’Malley strives for. Ware is going to get inside and make this an ugly fight, either with takedowns or clinch strikes. I think this fight is going to play out the way Matt Brown and Stephen Thomson did, which in the end is going to turn O’Malley into a better fighter for it. But for now, I got Ware taking this one via decision. 125 lbs. : Barb Honchak vs. Lauren Murphy – The one problem with Murphy is that she is better than she performs in the octagon. She has a well rounded game, but her hesitancy to strike and mostly failed takedown attempts have cost her. Murphy usually is pushing her opponent to the cage and “attempting” to take them down, while lacking volume or any powerful shots while in the clinch. As much as I believe in Murphy’s abilities, Honchak is just better in every aspect. So with that, I have Honchak via decision. 185 lbs. : Gerald Meerschaert vs. Eric Spicely – This is a fun fight between two high level grapplers. Hopefully the grappling doesn’t cancel each other and we get a striking battle, but who knows. If it stays on the feet, I’d edge in favor of Meerschaert. He’s definitely the more athletic of the two. However, I believe that Spicely, perhaps due to his physique is overlooked and thought of an easy victory. I think that’s exactly what Thiago Santos thought and he paid for it. Now Meerschaert might not be in that same mentality, but I could see him not respecting Spicely on the feet only to be caught and submitted. 125 lbs. : DeAnna Bennett vs. Melinda Fabian – This going to be a one-sided takedown-fest. Bennett via decision. 135 lbs. : Brett Johns vs. Joe Soto – Johns looks to be a legit prospect at only 25 years of age and a perfect 14-0 record. He’s already 2-0 inside the octagon and has shown solid striking and grappling abilities thus far. However, he hasn’t faced anyone of Soto’s caliber. With three straight wins, Soto has really shown vast improvements. In his last fight against Rani Yahya, showed his takedown defense to be solid and even was outgrappling a superior grappler in Yahya. This fight won’t be easy, but I think Soto is going to edge this out via decision. 125 lbs. : Montana De La Rosa vs. Christina Marks – De La Rosa has a lot of heart and has a nice submission game to boot. Considering Marks has been submitted six times, I would have to assume she’s uncomfortable when she’s put on her back. So with that, I got De La Rosa via submission. 185 lbs. : Ryan Janes vs. Andrew Sanchez – This is a terrible fight for Janes, as I don’t see where he is going to be able to use any of strengths. Sanchez is a superior wrestler with smothering top control and decent ground-and-pound. He was a round away from defeating Anthony Smith, which would of extended his UFC record to 3-0. Expect him to bounce back and in a vicious way. Sanchez via TKO! 125 lbs. : Karine Gevorgyan vs. Rachael Ostovich – Gevorgyan is a poor defensive wrestler, which is going to be exploited heavily by a strong wrestler in Ostovich. I expect Ostovich to take Gevorgyan down at will, eventually submitting her in the second round. 125 lbs. : Ariel Beck vs. Shana Dobson – Both women are rather inexperienced, but I’m going with Dobson via decision. 125 lbs. : Gillian Robertson vs. Emily Whitmire – I’m going with Robertson…actually what happened to Kenny Robertson? Two split decision losses and then cut? That’s crap! Back on topic. Robertson via decision.